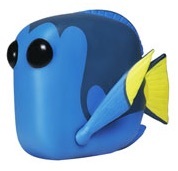 Dory is best known as the forgetful fish who stayed positive and just kept swimming. Funko Pop Finding Dory vinyl figures tell her own tale in a sequel to the animated classic, Finding Nemo. The long-awaited follow-up movie to Finding Nemo, Finding Dory takes place six months after the events of the first film. Ellen DeGeneres again provides the voice for the plucky regal blue tang and Ed O'Neill is the man behind Hank, the octopus. Other notable names include Albert Brooks as Marlin, the clownfish from the original movie, Diane Keaton as Jenny (Dory's mother), Eugene Levy as Charlie (Dory's father), and Ty Burrell as Bailey, the beluga whale. Shop for Finding Dory Pop Figures on Amazon. Technically a re-release from the Finding Nemo Pop! 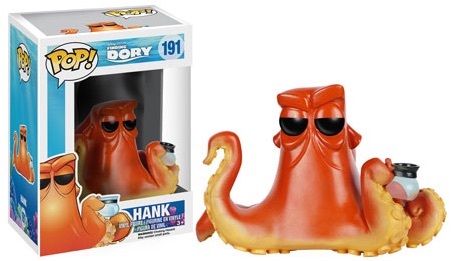 line, Funko Pop Finding Dory includes a "From The Vault" figure for Dory that comes in an updated box with a new number. 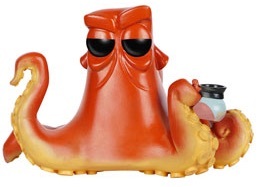 Collectors can also find a figure for Hank. The orange octopus is shown clutching a coffee pot. 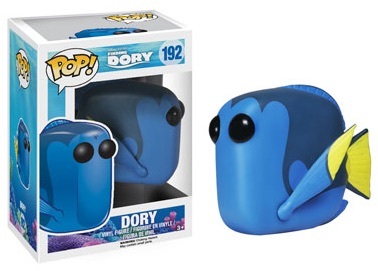 Funko Pop Finding Dory figures are numbered as part of the Pop! Disney line and they stand about 3 3/4" tall. In addition to the Pop! options, there is also a Mystery Minis set that includes a larger pool of subjects in a blind-box format.